SPOILER ALERT: The following contains spoilers regarding all FOUR Pirates movies. Do not read, I repeat, DO NOT READ, if you haven’t yet seen the movies! If nothing else, Disney delivers consistency!! In Pirates 4, they’ve once again found a subtle, but clear way to drive home their message of syncretism. The most basic theme of Disney’s mythology is the Romantic notion that the archetypal exists, and not only does it exist, but that beauty is to be found in the emotional experience of the archetypal. Disney’s myths attempt to deflate tension created by a dialectical approach to relationships by offering a “yes/and” option to the traditional “yes/no” question. In this aspect, they are most typically post modern. However, the “yes, and, and, and and…” answer that Disney continues to offer brings forward the concepts of Romanticism, because it suggests that unity is found in diversity and that unity speaks the language of love: passion, compassion, kindness and possibly obsession. The Pirates franchise seems an unlikely candidate for this message, but oddly enough, it has been one of its key themes since the beginning. The series begins with Elizabeth Swan as a small child, aboard a ship that rescues a mini-pirate by the name of Will Turner. At first glance, Elizabeth seems the archetypal image of the era’s aristocracy. She is obedient, intelligent and she knows her voice and her place. BUT, the fact that she loves Will from moment she spies him in the water suggests that all is not what it seems with her. Pirates 4 goes there, developing the theme of the star-crossed lovers YET again, but with a bit of a twist this time. This time the lovers are not simply from opposite sides of the sociological tracks, they are different species. Furthermore, they are different mythic systems entirely. Phillip, our adorable young missionary, is the archetypal Christian evangelist (almost Bunyan-y in his fervor). He falls desperately in love with Syrena (nice play on words there, Disney! Way to refer to Homer!) our mermaid, who is dark and dangerous with eyes that are deeply expressive. The audience is introduced to Phillip when Captain Jack Sparrow notices him tied to the mast of Blackbeard’s ship, Queen Anne’s Revenge. 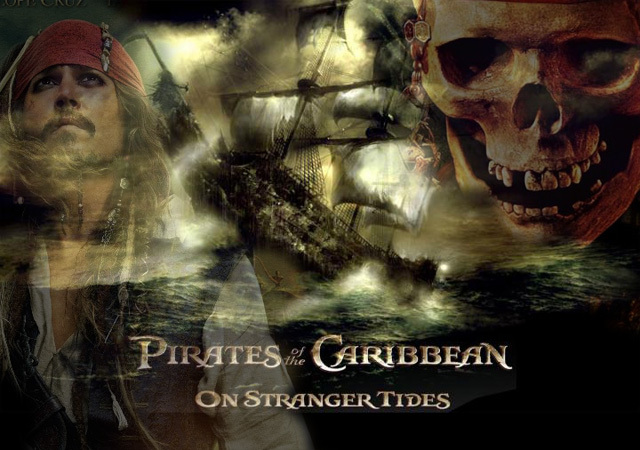 When Jack asks what his crimes have been, he is informed that Blackbeard wanted to kill him for the lip he’d been giving him, but Angelica, (Penelope Cruz), Blackbeard’s daughter and Jack’s past lover (who, herself, wears the image of the cross and is on a mission to save her father’s soul), argued against it. She insists that to save his life would bode well for the survival of his immortal soul. Phillip is eventually released during a mutiny organized by Captain Jack. The young missionary immediately speaks up for the fellow sailors who have been involved with the mutiny, seeking to save not only their lives and souls, but the soul of Blackbeard as well. Blackbeard continues to ignore him, making is clear that his life also hangs in precarious balance. Later, as the crew hunts for mermaids, Phillip is among the first to be used as a decoy to draw the mermaids near. The sailors cower in longboats as they recount legends about mermaids luring men to their deaths at the bottom of the sea and eating them. Suddenly, Phillip notes movement in the water. The crew perks as a stunning creature (who looks surprising like actress Amanda Seyfried) approaches the stern of the boat, cooing to the sailors to hear them sing. The sailor with the notable voice is lured to her, and as he reaches out to kiss the mermaid, she pulls him over and the fight begins. Well anyway, i could recount the entire plot, but suffice it to say, they fall into a passionate infatuation with each other. The mermaid’s tears Blackbeard needs for the ritual required for efficacy of the aqua de vida are acquired only when Syrena cries out of relief that the man she says is not like the others is alive. I’ll wrap up this segment by saying that she becomes the savior to Jack Sparrow and Angelica, and a savior to Phillip, kissing him and dragging him down beneath the water in order to heal a presumably mortal wound he receives during the final battle. So what’s the point? Really now, I find it fascinating that this romantic lead is a missionary. He is such a fervent believer in Christianity that he takes up with the infamous pirate Blackbeard just for the sake of saving souls on his ship. And, our heroine is a mermaid, the very creatures with fangs who capture and drown all those men they inflame. This entire franchise is about mistaken identities and prejudice. It is about the reversal of social expectations. Pirates are expected to be vicious, ruthless killers with no moral code, sense or feeling for others. Clearly, this is untrue. Jack, Gibbs Will and Elizabeth reverse this expectation. But a passionate bond between a mythic creature and a Christian missionary?? Could it be possible for Christianity to come out of the clouds and back into the body? Disney suggests it so, as the fusing of desire between a minister and a pagan is presented here without either complication or any necessity for compromise? In typical Disney fashion, love wins. God is in his heaven and all is well. On Friday I went down to Los Angeles for my friend Darren’s ordination via the MCC denomination. Somehow, the entire trip itself seemed like a sacred journey. My dear friend, Bonnie drove me to the train station, and I hopped aboard, leaving Santa Barbara behind without so much as the chance to say goodbye to my sweet husband in person. Along the way, the train stopped twice, causing my “picking me up” schedule to crack just a bit, but also causing me to think a bit about what it means to actually go from point A to B with intentionality. It occurred to me that, in general, we don’t really do this. We take for granted the fact that travel is relatively effortless, and practically instantaneous. In a global environment where an astronaut’s trip to the moon can mean return within seven days, a heightened sense of awareness seems necessary in order to bring sort of intentionality to travel. There were many of us who traveled for the particular occasion. Heck, the recipient of the ordination himself traveled from Oregon for this occasion. Jamie drove out from Nebraska, Brit flew from Seattle, Soph from Scotland, and I took the train. Although it was a much shorter trip for me than for most of my friends, the sense of occasion, and the necessity for pause was not lost on me. 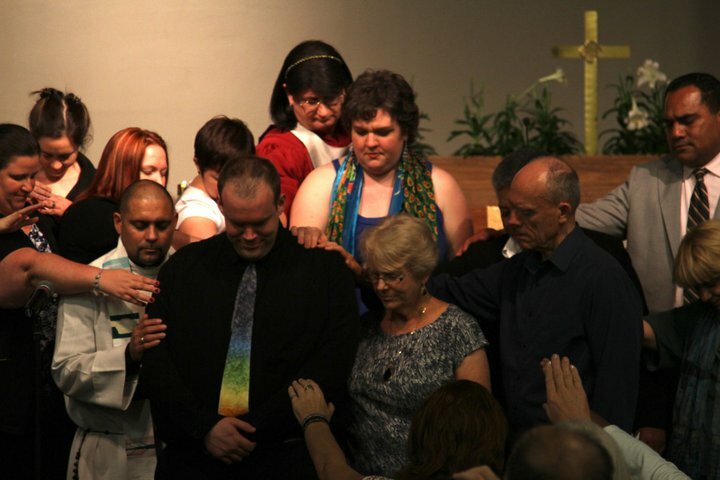 Ordination is a sacred ritual, and like any other ritual (according to many theorists: Bell, Van Gennep, Turner, Eliade, just to name a few), it requires separation from the collective, initiation, ceremony and an irrevocable change in the initiate’s status. Such an occasion necessitated much more reflection time than we were able to afford it, as our time together was short. Anyway, of this to say that none of this was lost on me. Although I was frustrated at how long it took for me to get to Los Angeles, I did my best to place myself into the frame of mind that would cultivate awareness. After an interesting (albeit slightly harrowing) experience of public transit in the heart of downtown LA, I connected with two of the ladies of the “hub”, and we headed off to Darren’s family home in Arcadia. Just bringing this group of people together facilitated a total shift in consciousness. I truly believe that it is impossible for anyone to be more different in temperament, background and orientation than we are. But, it totally works. The “pack” was back together, and it felt like a moment since we had been, rather than the years that have actually passed. If pilgrimage is a journey to a sacred place for the sake of encountering the “other”, than this was the archetypal image of a pilgrimage. The MCC, or the Metropolitan Community Church denomination, is a place the embraces those who have been outcast by other orthodox Christian denominations, and through an intentional breakdown of the alientation that cause us to hold each other at a distance, this organization (as imperfect as I’m sure it, like all organizations, is) creates an environment that offers acceptance and peace in the midst of its “otherness”. In its structure, it was similar to any other kind of service. However, it really affected me. It moved me in a way that church services generally don’t, knowing that no matter what kind of difference was brought to the table (whether we were gay, straight, white, black, Catholic, Jewish or Buddhist) the table would be open for all. Somehow, I feel that that’s the point, no? So…now that I’ve had a couple of days to digest both the whirlwind travel to and from San Antonio and Easter, I think I’m ready to blog about the experience. 1st day: I told Ms. Prisca that it will be a LOOOOONG time before I complain loudly about the climate here in California. We left on Wednesday, and the flights over from Santa Barbara to Denver and Denver to San Antonio were uneventful enough and the baggage claim was easy to locate. All in all the San Antonio airport was just fine. However, when we walked out the door, it felt like we stepped into a sauna. Hot, wet air accosted the lungs in such a way that I swear I have never felt before. Even when I visited Boston in late July, it was not that humid. Not that I’m complaining, it was just a fascinating experience that gave me major perspective on the climate here in Santa Barbara (a climate that I complain a lot about). Bruce and I took a taxi to the hotel, and we checked in with no difficulty at all. The gentleman that checked us in was even interested in the topic of my presentation. 🙂 Later, he even gave me a bottle of water for my presentation. 🙂 Then, Bruce and I wandered up to our room and surveyed the neighborhood as well as we could from the 23rd floor. Next, we decided to walk over to The Alamo. The architecture was quite stunning. I never knew that Texas had so many quarries. Our taxi driver noted that Texas doesn’t have much in the way of topsoil. We both enjoyed seeing The Alamo. I didn’t expect it to be so easy to approach…free and stuff. I guess I’m used to the Cali way of making money off of all of our historical sites. Even the missions here in Cali require a small donation to walk through them…At any rate, seeing Davy Crockett’s rifle and vest really brought some historicity to the Disney Fess Parker version of the story. I enjoyed it, though we left a little early as I was jet-lagged, hot and dehydrated. After that, Bruce and I found a really cool Brazilian BBQ restaurant a hop and a skip from our hotel. We had a lovely dinner, and finally got to try some Stag’s Leap red. 🙂 YAY Cali wine in Texas!! After our leisurely dinner, we wandered back to the hotel and met the ladies for a chat. Pris and Rebekah had recently returned from a presentation that really got their dander up. *Full Disclosure* I didn’t attend this presentation, but according to Prisca, the person who presented suggested that Disney bears responsibility for oversexualization in animation, and she used Ariel as evidence of this. Pris was pretty pissed off over it, and although I might have been too if I was there, I had to find it laughable that someone would play it that lame and uncritically. I guess that’s why were there. 😉 Also, Prisca gave us some lovely anniversary/birthday gifts and cards. I absolutely loved my homemade shawl! Thanks PRISCA!! Room was comfy! Bed lovely! 2nd day: Slept in a little, but was up and ready to go by about 8:30ish. We had breakfast down in the lobby of the hotel, and then I headed over the other hotel to attend Rebekah’s presentation. There were four people on the panel, and the panel centered around a discussion of the sixties. The first presenter talked about student dissent at the unis. in Britain. It was an interesting talk, and quite scholarly. Clearly, this presenter drew her paper directly from research she’d done for a book. The second presenter gave a memory piece on coming of age during the atomic age of the 50s. What I found most provocative about his presentation was his examination of absurdity in regards to the presence of the bomb. As a person who grew up in the 80s, I find it difficult to imagine a time when there was anything other and a sense of fear and solemnity about the atomic bomb. However, after this presentation, I understand why culture presented the bomb as absurb…I mean, really, how else would it be possible to live with its presence? It really shifted my perspective on 1950s culture. The presence of a counterculture of absurdity brought home to me the reality that there were many who were conscious of the contradictions in society even as cultural conformity was the order of the moment. Rebekah was the third presenter. Her presentation was on the cultural descent into the underworld present in the film images of the late 60s and 70s. She discussed the death and dismemberment of the counterculture movements of the hippies and yippies. She presented mythic images that reflect this, as well as the eventual rebirth present in some of the films of the 80s. Good stuff all around!! Go Rebekah! Fascinating perspective and totally different from anything anyone else offered! The fourth presenter also did a memory piece. It centered on his personal experiences as Altamont. Good stuff! After we left Rebekah’s presentation, we headed over to a presentation by a guy from Cal State Fullerton discussing the construction of memory in culture and the use of it by Disneyland and Colonial Williamsburg. Interesting, and some of the conclusions he has come to have also been thoughts I’ve had. The most important for me was his suggestion that Disney (through the theme parks) seeks to sell memories to patrons before they even have the chance to experience them. I agree with much of what he was saying, but I think that it may also reflect the particular brand of ritual Disney creates. This kind of ritual is part of the creation of temple culture in general. People sell at temples. People buy at temples. There is evidence of this going all the way back to ancient Egypt, Rome and Greece. He definitely approached the topic from a Marxist point of view…interesting, but not holistic enough for my mythic mode of thinking. Post Millenialism is a phraseI’m using to define the ontology of our contemporary moment. It differs from Post Modernism in that in synthesizes utopianism, nihilism and self-reflection in a different way. Post Millenialists FIND themselves in the oblivion of the apocalypse. They find comfort in entropy. Post Millenialsts take apocalypse as a given, and they are suspicious of anything that offers cohesive structure. Another phrase I’m using in my dissertation that I should probably claim is mythic ritual. Mythic ritual refers to ritualized behavior that affects a psychological change. I would suggest that any ritual that actually functions is a mythic ritual. Mythic rituals effectively alter the consciousness of the participant, immersing them fully into the stories they embody. Our presentations: Prisca and I presented at 8:15pm on Thursday night. She and I were 2/3 of a Disney specific panel called “Disney: The Good, The Bad and Everything in Between.” Presentations were all good. 1st presenter talked about negative aspects of the images Disney offers through the princesses. I’m sure I don’t need to explore what she said there. We all know what kinds of criticisms leveled at Disney regarding their princess images. I was originally supposed to go last, but Pris offered her spot to me so I could be a direct rebuttal to the previous presentation. I presented on the Disney princess from the point of view of Jungian Psychology and the anima complex/projection. Essentially, what I said is that the images of Disney’s princesses reflect a particular sense of what the feminine state of soul looks like in culture and that their projection reflects this. Furthermore, anima is emotion and connection and the princesses reflect this. I focused a good half of it on Tiana and Rapunzel. I may work this presentation into a paper, and if I do, I will post it on the blog. While I lost my train of thought for a minute or so in the middle of the talk (I became concerned about time for a sec), I still think it went well. Prisca talked about Disneyization and Snow White. She suggested that Disneyization reflects the kind of mythic retelling of fairy tales that always occurs in any culture, and that Disney is in essence creating fairy tales for Americans. In doing this, she analyzed Snow White as a depression-era myth. I shouldn’t go too much into it on my blog, since the ideas belong to her, but *Nod* JJJJYESS! NEWHO, we fielded quite a few questions, and we even had a GUY in our audience. He sported an “I’m surrounded by idiots” t-shirt (nice reference to Jeremy Irons in “The Lion King”), and he gave thoughtful and cool thoughts on Disney’s images, their marketing and the impact of Michael Eisner. 🙂 NOICE! Today was a rather important day. It was my last day at OPUS as an assistant. For any of you readers who find this news shocking, let’s just say that the position was not made for me after all. However, I’ve left with the good wishes of the director and in good standing, so in the long run it will be just fine. 🙂 The fact that this happened as a bookend of my weekend in Los Banos got me thinking about the nature of cycles and cyclical consciousness as opposed to linear consciousness. Last Thursday, I attended the memorial service of an amazing woman who was without a doubt my mother’s closest female friend. In many ways, she was a second mother to me, and she was one of the kindest people I have ever had the pleasure of calling a friend. She suffered for three years (at least, there is some speculation as to how long she actually had her disease) with ALS or Lou Gerig’s disease, a horribly fatal and untreatable neurological disorder, which essentially unraveled her body until she just had to give up the fight. At the memorial service, the minister read the incredibly famous scripture from the Book of Ecclesiastes that talks about how to everything there is a season. I imagine that some might think that this scripture suggests a linear style of consciousness or some kind of evolution. I don’t buy into that. This tradition allows for a deep understanding of what Indian tradition calls Dharma, a place for everthing and everything in its place. But even further than that, it is an invitation to allow things to be what they are. It is a reminder that life has its rhythm, and that it is ok to allow that rhythm to be whatever it needs to be whenever it needs to be it. This style of consciousness is consistent with many other mythic traditions, and at this time (the beginning of Halloween week) it makes me reflect on the Celtic connection with death in relationship with the birth of a New Year. That is where I am today. I am learning when and how to embrace and (when the time calls for it) to refrain from embracing. Of Myths and (Hu)Men: Myth and Ritual of our Time · Life and popular culture from a mythologist's point of view.